When you’re stuck inside with single digit weather, one of the best ways to add some joy and warmth back into your day is to plan a vacation. We’re fortunate enough to live in a state that embraces its winters and offers a variety of attractions and vacation destinations for every kind of traveler, from the adventurer to the one seeking a break from a busy life. To help you lift your spirits and divert your mind from the snow storm going on outside, we’ve put together a list of amazing winter getaways from around Wisconsin to help you plan your next weekend away. Enjoy and stay warm! 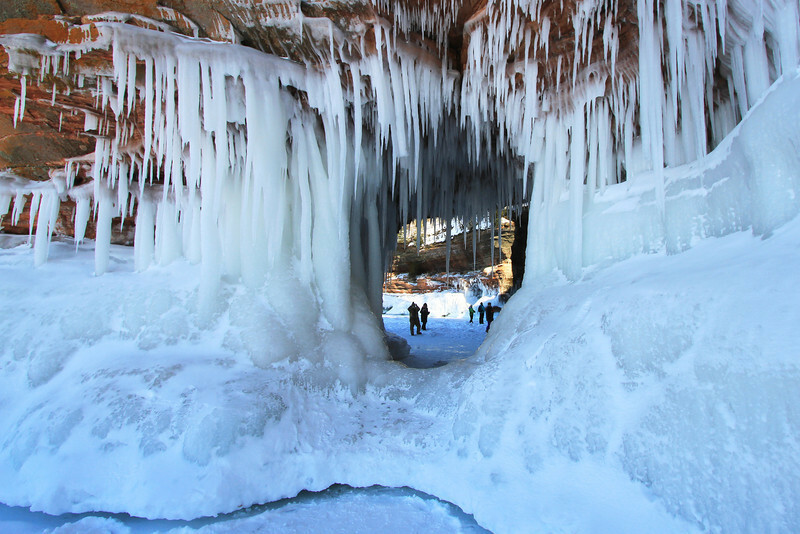 The Apostle Islands are a popular Wisconsin destination in the summer, but did you know that the area’s natural sea caves that form in the winter are one of the most wonderful sights in the whole state? Bundle up and hike over the frozen lake to get to these caves, which are covered with beautiful ice formations created by waterfalls frozen in place. After the ice caves, bundle up by the fire or enjoy soaking in the bubbly whirlpool at one of the many inns and hotels in the area. Craving some action? How about snowshoeing, snowmobiling, downhill skiing, or ice fishing? And before you head home, make sure to check out the ice road to Madeline Island—Wisconsin’s only temporary county road. Door County might be one of the state’s most popular summer vacation spots, but they also make one of our top picks for a winter getaway. The area hosts several festivals throughout the winter, which provide you with a great excuse to venture north and enjoy what the quiet season has to offer. On February 1st, you can head to Fish Creek for its annual Winter Festival. This event features live music, games, food, fireworks, and even a chili cook-off competition! On the 2nd, the town also hosts the Winter Wine and Cherry Fest where you can enjoy some of the area’s finest wines. On February 16th, Sturgeon Bay is the place to be for the Fire and Ice Festival, where you can find ice carvers and snow sculptors working on amazing frozen creations for your viewing pleasure. Apart from its many festivals, Door County has gorgeous trails, parks, and nature preservers where you can enjoy activities such as cross-country skiing, snowshoeing, ice fishing, snowmobiling, and ATVing. Eagle River is not only home of the largest chain of freshwater inland lakes in the world, but its 500 miles of trails make it a snowmobile paradise. Motorized sports not your thing? Bring your snowshoes and cross-country skis, or rent some at the Eagle Sports Center, and enjoy the well-groomed trails that attract visitors from all over the Midwest. Need a break from the action? The area features a variety of unique shops to explore and delicious restaurants to help you warm up with a cup of coffee or steaming soup. The cold season does not slow down this luxurious town. Winterfest, a nine day festival that usually starts at the end of January, is the perfect time to make the trip up and enjoy some of the best attractions the city has to offer in the winter. From ice sculptures and ice castles to live music, amazing food, and even human dog sled races, you’ll find something to marvel at and enjoy. Craving a little TLC? The city has a great number of resorts and day spas open year round that will help you melt your stress away and leave you feeling like new. After that, hop over to the downtown area to browse the unique antique and jewelry shops or stop by one of the charming coffee houses to warm up with a cup of tea or perfectly made cappuccino. Whether you’ve lived in Wisconsin your whole life or just moved to the area, it is never too late to start exploring your state and soak in all its beauty and customs. We hope that this little guide inspires you to bundle up and go get to know our beautiful state and everything it has to offer!